Great tips--I agree, the bring old/new items always works like a charm! 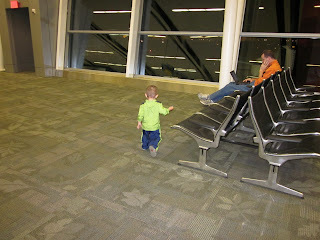 When my son was still an infant, I just walked to the back and hung out w/the stewardesses for awhile. They gave him extra crackers and oohed and aahhed over him. That was a nice break! This is fabulous! We're flying with our young toddler after Christmas, so I'll need to remember these! Great post! Love the idea of boarding at separate times - what a great tip. I love the "forbidden items"! I'm feeling confident on the open road but we're tackling the air next year. I agree with so many of your tips -- running around the terminal is KEY! I also think lots of favorites plus new novelty items is a great idea.